Carmel River State Beach offers fine views of Carmel and Point Lobos, and Monastery Beach (also called San Jose Creek Beach), at its southern end, is a popular diving spot. The beaches themselves are not accessible unless you can bring a beach wheelchair. •Length: Under one mile total •Typical Width: 4 ft. & above •Spur trails are less than 3 feet •Typical Grade: Gentle •The approach to the trail has a moderate slope, and spurs at the north end are moderately steep. •Terrain: Firm •Firm and smooth for all but the final loop, about 0.1 mile, which is hard but rough (gravel) Accessibility: •Beach Wheelchair: Yes •There are no beach wheelchairs at the park, but you can borrow one at nearby Monterey Beach (831-373-5357) or Asilomar Conference Center (831-372-4076) if you can transport it in your vehicle. 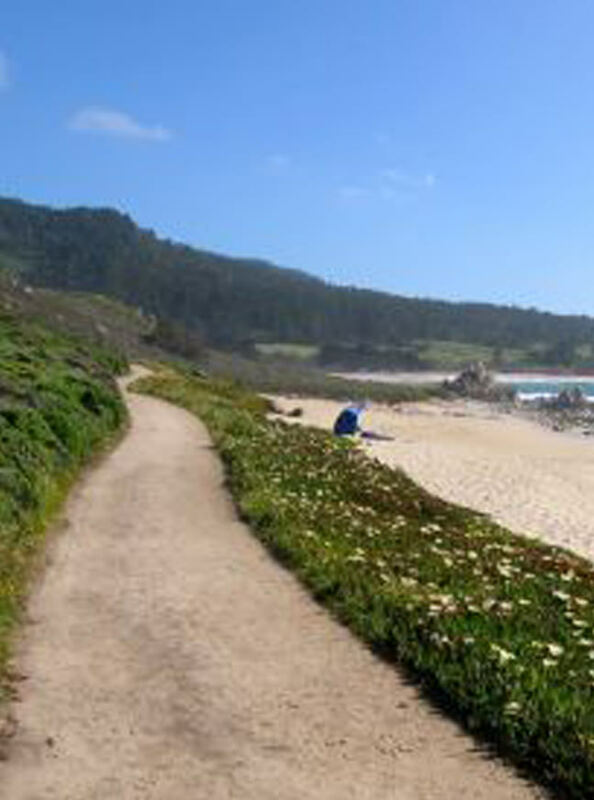 •Accessible Parking: Yes •The only designated accessible parking is at Carmel River Beach. There are no marked spaces at the trailhead, and room for only a few cars. •Alternatively, you can park at Monastery Beach (shoulder alongside Highway 1) and travel along the highway shoulder to the trailhead, but the ride can be bumpy. •Accessible Restroom: Yes •At Carmel River State Beach parking lot. No restroom at trailhead.